My girls love tutus. On two separate Halloweens they asked me to make costumes with tutus so of course I had to oblige. 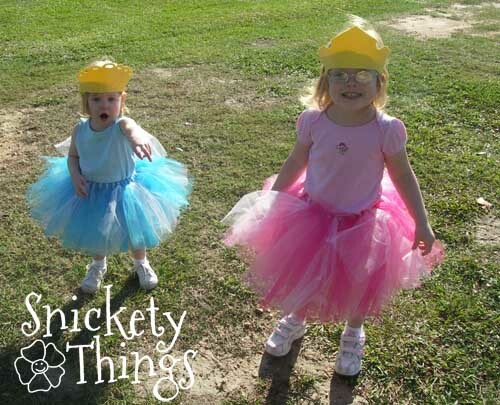 The first tutus I made for them were for princess costumes. The Princess went as Aurora and Boo went as Cinderella. At this young age they were so easy to please. I used foam visors I bought at Hobby Lobby and cut the crown shapes out. Then I just turned them around on their heads. The tutus are not the knotted kind, I sewed a pocket in each strip of tulle before running the elastic through. I used two colors of pink and white on Aurora and two colors of blue and white on Cinderella. They were made from the rolls of tulle you can buy at Hobby Lobby. Their shirts were just what was already in their closets and they are wore matching shorts under the tutu. Here they are on their candy gathering rounds. It was a bit cooler by this time and we put leggings on the girls to keep them warm. The very next Halloween they requested tutus again. This time they wanted something a little more elaborate. 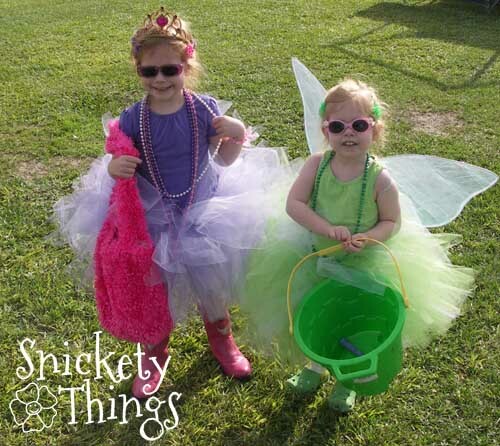 The Princess wanted to be Fancy Nancy and Boo wanted to be Tinkerbell. 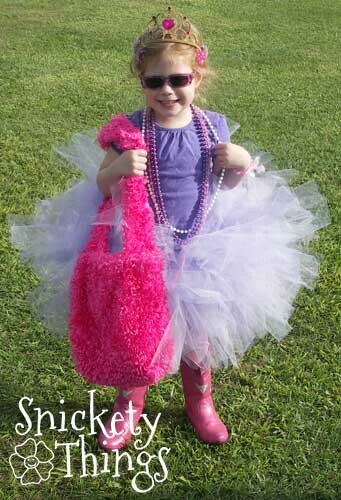 The Princess was really happy with how Fancy Nancy turned out. She is wearing a Fancy Nancy crown she got for her birthday that year. The beads are from their dress up box. It is hard to see in the picture, but she is wearing leggings under her tutu. The bag is something I picked up at a children's consignment sale and it worked great to collect candy in. She is wearing a pair of cowboy boots that light up when she walks. The shirt is one she had in her closet. 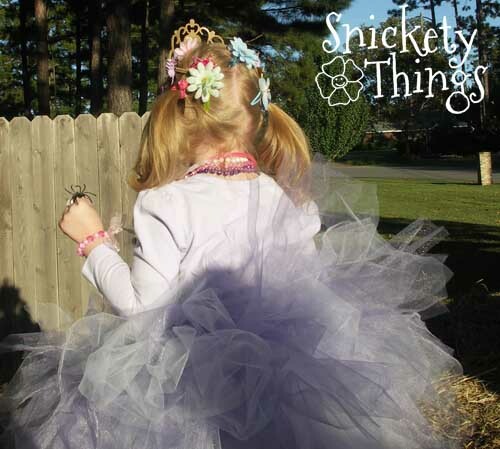 The tutu is made the same way as the ones above, but I alternated strips of lavender and white. The above picture is from our church festival so her hair was just pulled back. 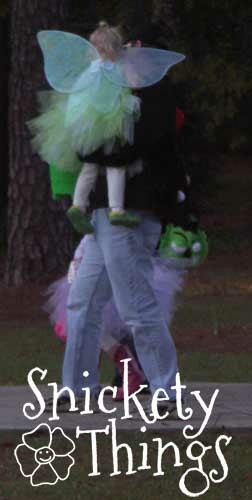 This is the back of her hair on Halloween night. She wanted her hair in dog ears and just put all of her fancies barrettes in. This is how she looked from the back. 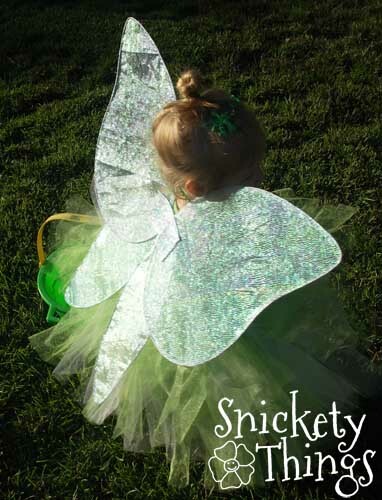 Boo's Tinkerbell costume was fun to do. She is wearing a green tank top from her closet along with more of the dress up box beads. She has on a pair of leggings and is wearing green Crocs. 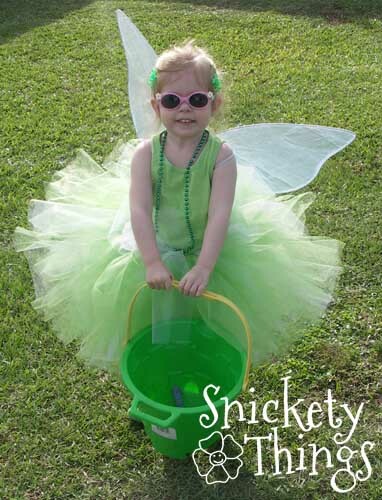 Her tutu is made with alternating strips of green and white. That is one of her buckets that she used to collect candy. I bought these wings at a local thrift store for a dime. They had holes all over them, but I was really more interested in the frame. I took the material that was on them off and replaced it with an iridescent fabric I bought at Hobby Lobby in the scraps bin. I just glued it along the edge of the frame with fabric glue. Three years later and they still hold up well. You can also see I pulled her hair up in a bun like Tinkerbell's hair. After a lot of walking, our little Tinkerbell started to fly. Okay, so her daddy just started carrying her, but she said she was flying. 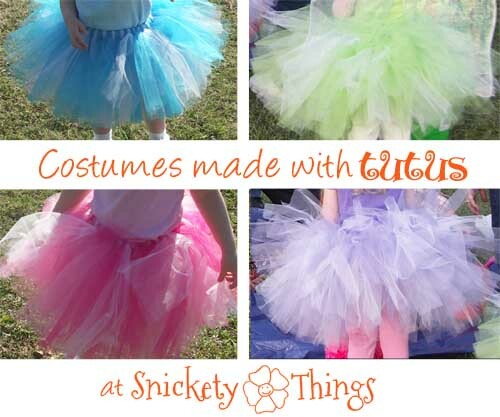 Have you made in costumes using tutus? If you want to see more Halloween costumes I've made, check out Toy story Jessie, Pinkalicous and Mickey & Minnie Mouse. You can also see some Halloween Jack-O-Lantern nail art here. I was a little disappointed when mine no longer wanted them. There is always next year! I love tutus, so I had to check out your costumes. How adorable! Adorable costumes and little girls. Kids easy to please because it makes them happy even the simple things. These are such good ideas! It makes me wish I had a girl! Thanks! You don't think you could get your boys into a tutu? These are insanely cute! Thanks for sharing!! Hey Renonda! 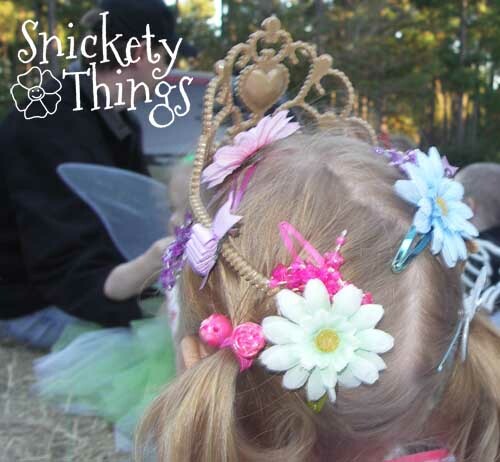 I am hosting a Halloween Edition Link Party and wanted to invite you to link up your costume inspiration! 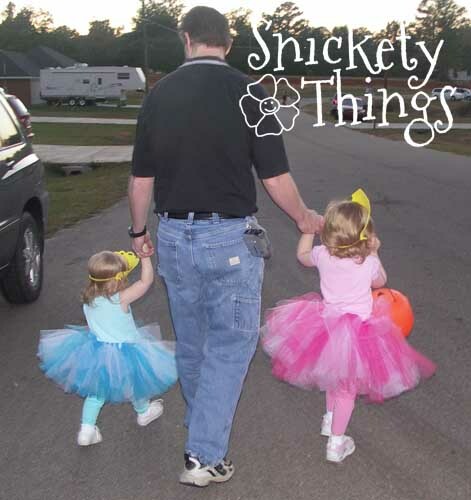 These tutus are too cute! I love how fluffy they are!! This just cam through my inbox! I stopped by Shelley. Hope you guys are staying warm up there.